The proposed FAA reauthorization bill introduced in the U.S. House of Representatives this week falls significantly short for airline passengers and air cargo shippers when it comes to advancing the high standards that make air transportation in the United States so extraordinarily safe. A key reason for the extraordinary safety of our system is our commitment to providing airline pilots with the highest standards of training and qualification. Today’s first officer qualification and training requirements were prompted by Congress in 2010 following four fatal airline accident investigations that identified the pilots’ lack of training as a factor in the accidents. These regulations weren’t arbitrary, nor were they sudden––the safety-focused rules came out of an industry-wide effort led by representatives of the regional airlines. We are pleased the sponsors of the House FAA reauthorization bill recognize the importance of these regulations and agree that they must remain firmly in place. ALPA will vigorously oppose any attempts to change this regulation via amendment to the FAA reauthorization bill. The bill in its current form, however, fails to address the hazards posed by the unregulated transport by air of lithium batteries—an issue that is a top priority for all ALPA pilots. Recently, the International Civil Aviation Organization (ICAO) recommended moving forward to ban lithium-ion batteries from passenger airlines as the first phase in a long-term plan that promotes their safe transport. This international action is indicative of a unified front that acknowledges the danger of these batteries and that they must be appropriately regulated. While we agree ICAO is on the right track, the United States must lead on this issue and immediately regulate all lithium batteries shipped by air––on both passenger and all-cargo aircraft. The bill also fails to enhance aviation safety by protecting access to the cockpit through mandatory, physically installed secondary barriers (PISB). Secondary barriers are lightweight, retractable locking screens that install between the flight deck door and cabin to give the crew time to shut the fortified flight deck door before a potential intruder has an opportunity to compromise security. For many years, ALPA has maintained that PISBs are an effective way to add an additional layer of security to the cockpit at a modest cost, and it’s time that they are put in place. Congress must provide the FAA with long-term, reliable funding to safely operate the U.S. air transportation system and execute the next-generation air traffic reforms that will bring additional safety and efficiency. As the world’s largest nongovernmental aviation safety organization, ALPA will never let up in our call for Congress to put forth an FAA reauthorization bill that puts safety first. 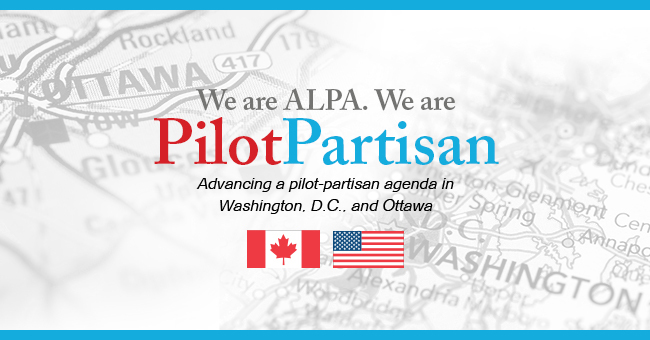 Follow Leadership from The Cockpit for more details on ALPA’s view on the FAA reauthorization bill.